If you’re looking to enjoy the delicious taste and healthful benefits of kimchi, you might be overwhelmed by the unfamiliar practice of fermenting vegetables at home. Believe it or not, it’s quite easy. The origin of kimchi dates back at least to the early period of the Three Kingdoms (37 BC to 7 AD), and fermented foods were used widely as a way to preserve foods in the cold Korean winters. If you want to have a role in its incredible history, reap the proven health benefits that its probiotics hold, or just use it as a delicious garnish on your fish, poultry, or beef, you can make your very own with ease. While there are over a hundred different types of kimchi, mai kimchi, or simple kimchi is what you will most likely be making at home. The first place to start is the main ingredient of kimchi: cabbage. Not just any cabbage, either, you will need to get your hands on baechu, or napa cabbage. 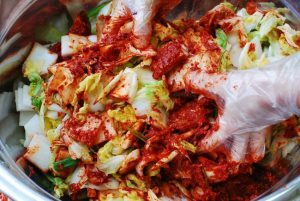 In the first stage of making kimchi, you will soak the cabbage in a salty brine that kills harmful bacteria. In the second stage of fermentation, the remaining Lactobacillus bacteria coverts the sugars in the jar into lactic acid. This preserves the vegetables inside and gives them that recognizable tangy smell and flavor. That’s just a brief overview, however. Let’s go over a step-by-step look into how you can make kimchi in your own kitchen! It shouldn’t come as much of a surprise, but the list of ingredients you will need is quite short! The ingredients are only half the battle! You’ll also need a specific list of equipment as well. Now that you know what you need, it’s time to go over a step-by-step guide. Cut up the cabbage lengthwise through the stem into the quarter. Cut out the cores from each piece. Cut each quarter crosswise into 2-inch-wide strips. Place the cabbage in a large bowl and sprinkle with the salt. Using your hands, massage the salt into the cabbage until it starts to soften. Add enough water to cover the entire cabbage and put a plate on top of the cabbage to weight it down. Keep it that way for one to two hours. Following step 2, rinse the cabbage under cold water several times. Set it aside to drain for 20 minutes. Make the spice paste by adding the ginger, garlic, sugar, and stir into a smooth paste. Then stir in the gochugaru. Use 1 to 5 tablespoons depending on how spicy you want your kimchi to be. One combined, set aside until the cabbage is ready. Combine the vegetables and spice past, first gently squeeze any remaining water from the cabbage and add it to the spice paste. Add the radish and the scallions. Mix the paste and vegetables thoroughly by using your hands to gently blends. The kitchen gloves are optional at this stage, but are highly recommended because they protect your hands from stings, stains, and smells. Pack the kimchi in your 1-quart jar. Press down the kimchi until the brine rises to completely submerge the vegetables. Make sure to leave at least one inch of space at the top. Then, seal the jar. Place a bowl or plate under the jar to help catch any overflow that may take place during the fermentation process. Let the jar stand at cool room temperature, our of direct sunlight, for one to five days. Make sure to check your daily once a day during the fermentation process. You can open the jar and press down on the vegetables with a clean finger or spoon to make sure that they are submerged under the brine. You can also feel free to taste to see just how tangy your kimchi is becoming. When the taste meets your desire, transfer the jar to the refrigerator. You are more than welcome to start eating it right away, but really kimchi is best after being refrigerator for another one to two week! 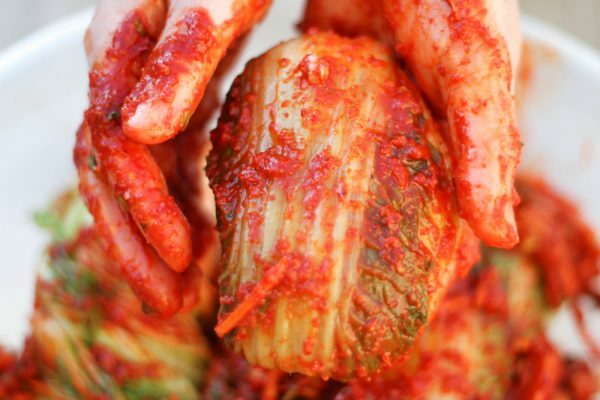 Now that you are enjoying your very own kimchi, you might want to know a few of the incredible health benefits that it offers. It helps your digestive system. Kimchi contains millions of lactobacilli also known as “good bacteria.” They normally live in our digestive system and help us digest what we eat. Diet and stress can reduce the amount of lactobacilli in our gut, and eating kimchi helps restore their population. Research has shown that approximately 70 percent of your immune system exists in your digestive system due to the food and drink we consume. Because of this, scientists have linked probiotic rich foods like kimchi to help immune system. Good bacteria in your gut improves your bodies defense against pathogens. Kimchi is composed primarily of vegetables such as cabbage or radish which are both high in satiating fibers. Those kinds of fibers are fantastic because they easily make you feel as if your stomach is full after eating just a little bit of food. On top of that, probiotics are known to play a part in weight reduction and stopping sugar addiction. In fact, recent studies have shown that improving the good bacteria in our gut, such as lactobacillus, can help the body regulate the cholesterol it absorbs through the digestive tract. Lactobacillus from Kimchi has even been seen as a powerful weapon against obesity. Many have speculated that this may be the reason why the obesity and overweight population in Korea seem to be very low compared to other countries around the world.